Wait until you see the kitchen. When Taylor Clouse set out to design her client’s 1940s home, her inspiration was an Austin version of a surf shack. The primary goal for the designer was to create a space that felt clean and natural—all the while maintaining the historic integrity of the structure—and one that could double as a relaxing reprieve for the artistic duo who called it home. 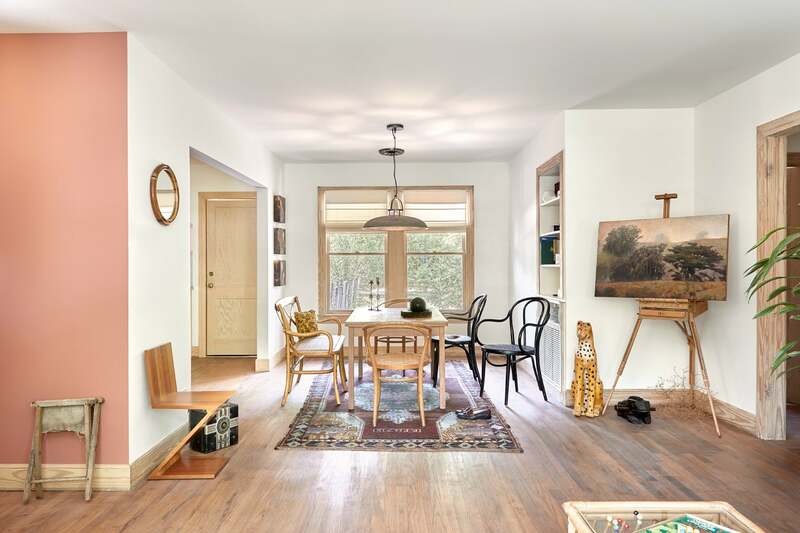 Built in the early ’40s, the three-bedroom home stands in at under 1,300 square feet. While a handful of key, functional changes were made—such as stripping the original flooring and trim and knocking out a wall to give the kitchen more space—roughly 90% of the home’s original features remained intact. Maintaining those subtle, storied details was key for the designer to uphold the charm and characteristics that couldn’t be bought. The unique location of the dining room provided Clouse with the prime opportunity for taking a creative risk with color. While the room itself was designed with a pared-down, neutral scheme in mind, the pop of coral from the adjacent entry permeated the confines of the space. “We wanted to pick up on tones that related to the wall throughout the space. The client really loves blue, so the coral was a formulated complement that’s a nice, bright pop to see from the front door,” says Clouse. The idea here was to play off of the hints of terra-cotta, found on the porch, which would, in turn, establish an element of cohesiveness throughout the home. To offset the neutral backdrop of the dining room, Clouse filled the space with dynamic shapes and volume—design elements that came in the form of the cheetah statue and the art placed on the easel in lieu of the wall, respectively. “It’s more of an artistic concept, creating a balance between how the house looks in both a 3-D and 2-D composition—leading your eyes on a journey,” adds Clouse. While little color was used throughout the home, the idea here was to offer just a hint of it, sans an overwhelming feel. In this home, color was meant to be timeless—there, but not in your face, according to Clouse. The chromatic theme extends into the kitchen, where the maple-veneered plywood cabinets are complemented by the red oak flooring and pine trim, doubling as the undeniable focal points of the room. Having designated the living room as one of the more artifact-heavy spaces of the home, Clouse went into the design of the space with the intention of, what she calls, creating a story of experiences. “The design serves a dual purpose: creating a welcoming space while providing topics of conversation,” she adds, “where someone has been and what they chose to keep as mementos.” In short, the space should function as a source of invitation and comfort, not a disruption. In the bedroom, Clouse doubled up on the wall art above the bed to establish a nontraditional and eye-catching detail. In lieu of concealing the map’s tattered, aging edges with a frame, she left it as is and juxtaposed the piece with a framed print layered on top, hinting at the expected framing method. Textiles were integrated liberally throughout, sourced from the clients’ many travels, along with various family heirlooms. The thoughtful layers helped keep the room refined, while the vintage details instilled an element of character. “You want to create a balance between old and new, textured and smooth, and so on,” says Clouse. A decorative mindset that was clearly established throughout, thoughtfully integrated within the seamless transition between the storied elements of the home and the new.